Originally published in Creation 12, no 4 (September 1990): 22-24. Michael Faraday was born in the village of Newington, Sussex, England, on Thursday, 22 September 1791. He was the third of four children. Shortly after his birth his family moved to West London, where Michael grew up. The family were devout Christians and worshipped at a small chapel four kilometres away. Poor health prevented Michael’s father, a blacksmith, from working full-time, which caused financial hardship. After less than two years of formal education, Michael left school. When aged about 11, he became an errand boy for a bookbinder. When he turned 14, he began an apprenticeship as a bookbinder. By spending his spare moments reading some of the books he was binding, Michael took advantage of a great opportunity to educate himself. He became fascinated with science, especially chemistry and electricity. He began to reproduce some of the experiments about which he was reading. Bookbinding had trained him to become skilful at using his hands, which greatly helped him manipulate scientific apparatus. Michael began attending weekly science lectures. He kept detailed notes and bound these notes into beautiful notebooks. The lectures he attended included a series at the Royal Institution by Sir Humphry Davy, the famous chemist who later invented the coalminer’s safety lamp. (The Royal Institution had been set up to help increase public awareness of useful scientific inventions and everyday applications of science.) On completion of his apprenticeship, Michael sought a job in science. He used his beautifully bound notes of Sir Humphry’s lectures to convince Sir Humphry of his serious commitment to science. In 1813 he was hired when a laboratory assistant’s position became available. Michael Faraday’s scientific career had begun. Faraday’s scientific abilities quickly became apparent to those around him at the Royal Institution. Instead of merely preparing equipment and chemicals, he was soon assisting in the demonstrations at Sir Humphry Davy’s public lectures as well. By the time Davy left on a scientific tour of Europe six months later, he considered Faraday indispensable and took him along. The trip lasted two years and was extremely rewarding scientifically for Faraday. As well as learning a great deal, he met many famous scientists, including Ampere and Volta, after whom the electrical units amp and volt were later named. On returning to England in 1815, Faraday was re-employed by the Royal Institution. He became increasingly involved in chemical analyses. He conducted research on steel, making improvements in steel alloys. 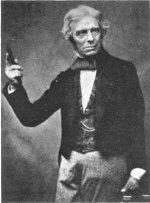 Faraday became the first person to liquefy chlorine. He discovered a new substance which was later called benzene. Benzene was subsequently found to be important in the manufacture of many useful organic compounds such as dyes, nylon and plastics. Faraday also produced some new types of glass in an attempt to improve telescope lenses. In that same year, 1821, Faraday was accepted as a member of the Royal Society—the professional body where the foremost scientists exchanged discoveries and ideas. Also that year, he married Sarah Barnard, a member of his church. Despite the disbelief of many scientists, Faraday believed that the reverse should also be true. To that time, experiments had shown that electricity produced magnetism. Despite the disbelief of many scientists, Faraday believed that the reverse should also be true—magnetism should be able to produce electricity. Faraday successfully showed this in 1831. Englishman William Sturgeon wound the current-carrying wire into a coil around a U-shaped piece of iron, thereby strengthening the magnetic effect of the current. American scientist Joseph Henry then insulated the wire, further improving the magnetic field. By making the iron into a complete ring and winding another coil of insulated wire on the other side, Faraday produced one of his greatest inventions—the transformer. When an electric current was turned on and off in one circuit, it caused a changing magnetic field which produced an electric current with a different voltage in the other circuit. Because electricity is generated and transmitted at high voltages and must be converted to lower voltages before it is safe for domestic use, the transformer is an indispensable part of the modern power supply network. Next, Faraday sought to generate electricity from magnetism without first starting with electricity. He created a changing magnetic field by moving a bar magnet in and out of a hollow coil of insulated wire. As in the transformer, the changing magnetic field produced an electric current. This discovery made possible electric power generation as we know it today. In a book on Faraday and electricity, Brian Bowers writes that ‘it seems likely that his religious belief in a single Creator encouraged his scientific belief in the “unity of forces”, the idea that magnetism, electricity and the other forces have a common origin.’2 Faraday went on to show that the electricity produced was the same regardless of how it was produced—by a magnetic field, by a chemical battery or as static electricity. Faraday then combined chemistry and electricity in his research work. He studied electrolysis, which is the chemical breakup of certain substances by passing an electric current through them. A special case of this is electroplating, where a piece of metal is coated with a different metal. Faraday’s work on electricity led him to discover the laws governing electrochemistry. He was also responsible for naming many of the parts of the new equipment (including the electrolyte, the anode and the cathode). Although extremely busy with his research and lecturing, Faraday always took an active role in his church. He was an elder for more than 20 years. Faraday’s church did not have a paid clergyman. Instead, the elders, including Faraday, took turns at preaching the sermons and leading the worship. Faraday’s church emphasized living by Jesus’ words in the Sermon on the Mount. The Christian principles embodied there, such as generosity, humility, and forgiveness, were clearly evident in Faraday’s life. He gave generously to charities and to the poor whom he also visited. He supported his widowed mother for many years. Faraday was not interested in acquiring wealth. He repeatedly turned down highly paid consultancy work for government and industry so he could concentrate on his more modestly paid research and lecturing work. Faraday’s fame grew. He had lunch with Queen Victoria, and members of royalty attended his lectures. However, he remained humble. He refused nomination for the position of President of the Royal Society in 1846. In 1864, he declined an offer to become President of the Royal Institution because it would have decreased the amount of time he had available for research. For the same reason he had declined the position of Professor of Chemistry at the University of London in 1827. Faraday’s forgiving attitude was tested on many occasions. He considered it appropriate to accept the Queen’s invitation to lunch even though it meant missing Sunday worship. But his fellow elders did not consider it appropriate. They took his eldership, and even his church membership, from him for a time. Faraday responded as Jesus would have. He continued to attend worship and behaved lovingly to those who had hurt him. Also, Faraday had some well publicized differences of opinion with Sir Humphry Davy during his career as a scientist. However, this never dimmed Faraday’s admiration for Davy. Faraday’s bad grammar and poor spelling reflected his lack of formal education, but his scientific genius is unquestioned. Michael Faraday died on Sunday, 25 August 1867. Just 14 years later, the first public electricity supply became a reality in Godalming, Surrey. Since then, his discoveries in electricity have continued to have a great influence on our daily lives. Joseph Henry, an American scientist working independently of Faraday, produced an electric motor slightly before Faraday did, but Henry did not publicize his findings until after Faraday. Consequently, English books generally credit Faraday with inventing the electric motor while American books usually give the credit to Henry. B. Bowers, Michael Faraday and Electricity, Priory Press, Hove, Sussex, p. 34, 1974. Michael Faraday, as quoted in Bowers, p. 86. L.P. Williams, Michael Faraday, Simon & Schuster, New York, 1971, as quoted in: C. Ludwig, Michael Faraday—Father of Electronics, Herald Press, Scottdale, Pennsylvania, p. 194, 1978.